Make your presence known fast simply by wearing this mens green velvet shawl collar jacket on red carpet night. When you want to be the king of the night, you need to know how to dress. A Mens green velvet tuxedo jacket will help you get there. 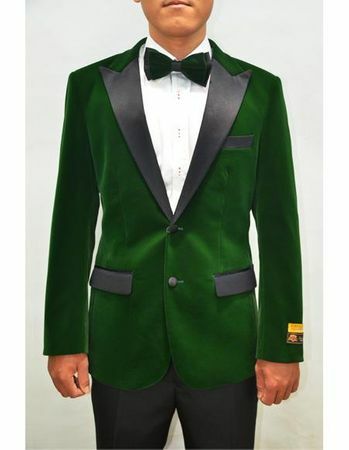 This green color velvet tuxedo jacket looks familiar because it is really a tuxedo jacket in style and attitude. Featuring side vents in the back, this green color velvet tuxedo jacket is perfect for that classy night time party you're going to. Modern fit.